Yesterday marked a whole month since this little fellow came into my life. This is Oby, my family's beautiful rescue dog. 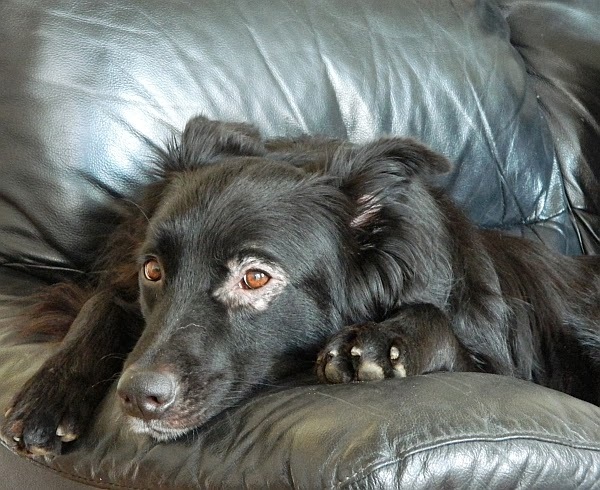 He is six years old and a border collie x German shepherd (just like Jazz). I wanted to share the story of how he came into our lives here on my blog, because I think it is truly special. Let me start by saying that my dad is not an avid tweeter. He rarely logs in to his account, let alone send a tweet, but one day (about a month and a week ago) he logged into his twitter and came across a random tweet from a lady that had just followed him. He clicked on the link in the tweet and it took him to the Nottingham City Stray Dogs facebook page where they were 'advertising' a dog called Oby. This beautiful dog had been stuck in the kennels at Babbington Rescue Centre for over four months - no one wanted him and he was losing weight extremely fast because he was so restless and depressed. As soon as my dad saw Oby on that very facebook page, he felt an instant connection, so much so that he told my mum, who as an animal lover was bound to fall in love him. What we didn't anticipate was just how deeply she was going to fall in love with him. We already had a dog, Jazz, as well as a cat, Thomas and had no plans to add to our family, but there was just something about Oby that pulled her in. After a phone call to the rescue centre, my mum and dad took Jazz to meet Oby, to see if they got along. We weren't sure that Jazz was going to accept another dog, but we knew we had to try. We were so pleased when it turned out that Jazz had no problem with Oby and in fact seemed to enjoy being taken on a walk with him! After a nervous few days waiting for a phone call, we were told we could bring our new baby home. When I first saw Oby at the rescue centre, I couldn't believe how skinny he was! You could literally feel every single one of his ribs and his backbone was more than obvious to the eye. A month on and we are glad to see that Oby has definitely put weight on! He has filled out quickly. Not that we are surprised, as if there's one thing our family is good at, it's at feeding people up! Oby settled in with us so quickly and we definitely can tell that he's happy here. He's every bit as loving as Jazz and though we don't know what happened to him in the past, we can tell that he feels safe and loved in our home. 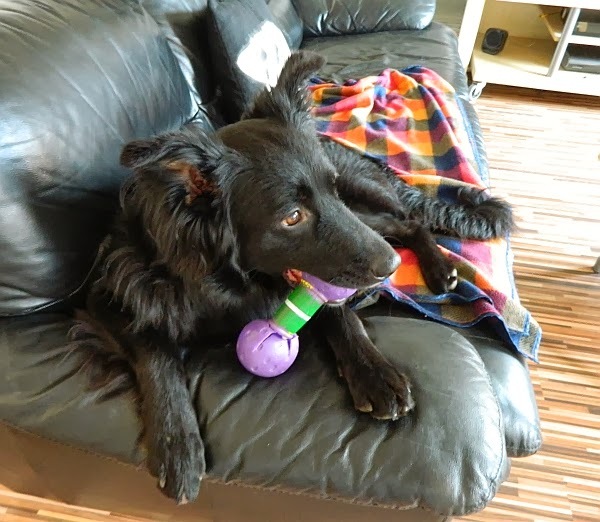 Oby already has a favourite purple bone toy, a favourite place to sit and a new found love for belly rubs. Oh and I love for food. The boy sure loves his food. He's so cute! What a sweetie! Ahh this is such a lovely story :) he is a beautiful dog, it's so heart warming to know that nice things happen like this. I plan to re-home some animals in the future once I have my own place.